In the human history of the Earth, a mere breath for the 4.5 billion-year-old planet, the next 50 years may be the most important. Earth has survived meteors, ice ages and soaring heat, and five mass extinctions. It will survive the era of human influence, the Anthropocene, too. Human survival, however, depends on embracing the opportunity — and the challenge — at hand: to protect the biodiversity that makes life on Earth possible. Biodiversity is about relationships among all plants and animals, including humans, says Pam Soltis, a distinguished professor recently named director of the University of Florida’s Biodiversity Institute, an initiative that grew out of the museum. “People have to realize biodiversity does matter to them, to their survival, and to their children and grandchildren,” she says. UF has 128 scientists and counting who work on biodiversity issues, and has married its huge advances in computing power to that work, making the Biodiversity Institute a collaborative nexus of biodiversity science unlike any other in the world, Pam says. The investment could not come at a better time, the Soltises say. They have watched their own field, plant genetics, advance by leaps and bounds, and they think it is time for biodiversity science to draw on genetics and other disciplines in a new grand challenge: learning about biodiversity on Earth, and what it could mean to human survival, before that biodiversity disappears. In the midst of what many view as the sixth great extinction, scientists think we are losing species at 1,000 times what is normal. The scary part, Doug says, is we often do not know what we are losing. Nature is the best chemist, and plants we have not discovered yet could yield a cure for a disease. Some losses we recognize, an ecosystem, for example, but without realizing we rely on it to scrub pollution from the air we breathe, or filter the water we drink. Some losses may sneak up on us. Our great grandchildren may only know charismatic big mammals — elephants, rhinos, gorillas — as stuffed animals. On a rapidly changing planet, the Soltises say, we need to view biodiversity as a lifeline, and grab it. The connection of one form of life to another is clear to biologists like Doug. 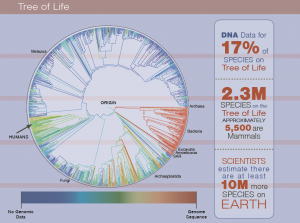 But to make it clear to the rest of us, he and dozens of collaborators embarked on a gargantuan task in 2012, to build a Tree of Life, showing all known species. Doug had been told it could not be done, but the idea had been nagging him for three decades, so he jumped at the chance to work on the project, funded by the National Science Foundation. In 2015, the international group published the Tree of Life and put it online for anyone to view or use. The Tree of Life is depicted as a circle with the origin of life in the middle. From there, lines radiate along the circle’s rim, showing clearly, Doug says, that relationships matter. Of 2.3 million species on the tree, only about 5,500 are mammals. Among the mammals, humans are a speck, a single species reliant on all the others for a functioning planet. Although the tree is an enormous accomplishment, it’s only a rough draft, meant to be revised as discoveries are made. There is only DNA data, for example, for about 17 percent of the species on the tree, leading an international group of scientists, including Pam, to propose a gigantic sequencing initiative in February. 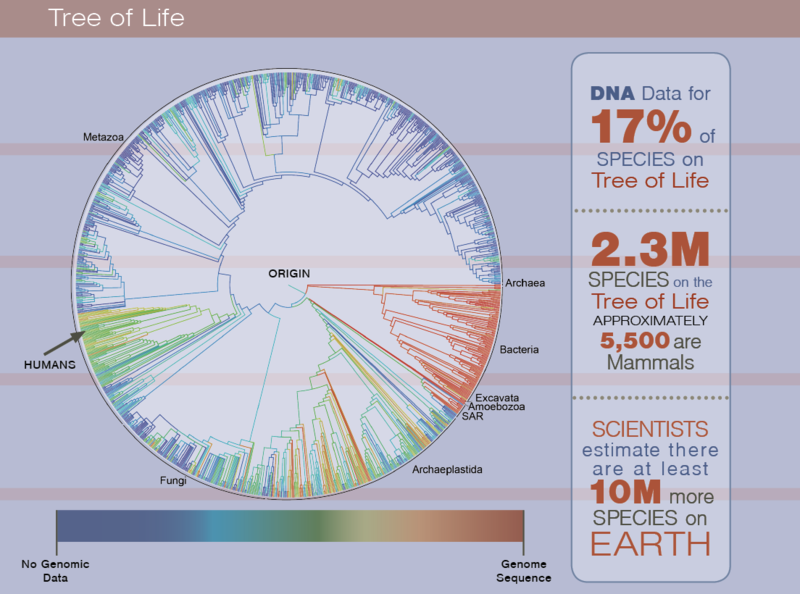 And the species on the tree are just a fraction of life on Earth. Scientists think there are at least 10 million more species out there, a biodiversity challenge of epic proportions. They are chipping away, discovering about 14,000 new species each year, but at that rate it will take 900 years to describe and name what we think still exists, and Doug says 900 years is way too long for a planet experiencing rapid change. Doug points out that the cancer drug, Taxol, is based on a compound first found in the Pacific yew. The Pacific yew, however, is not common, so a better source was needed. By looking at the relatives of the Pacific yew, a more common variety was located, and that tree was used as the source of Taxol until the compound could be made synthetically. Taxol is just one example of the promise of plant chemistry, and has prompted pharmacologists, including a group at the University of Vienna, to use the Tree of Life as a tool to identify plants potentially useful in drug development. Scientists cannot use these plants in the future — for medicines, cures, crop improvement, soil improvement, clean water, clean air or ecosystem management — if they become extinct. Finishing the tree would take a major investment in biodiversity and more public awareness of the need for biodiversity. Recently, they checked that goal off the list, thanks to rapid advances. “We published that in 2013,” says Pam, who recalls a time when it was possible to know each base pair in a sequence intimately because the sequencing process was so slow. Today there is a flood of data, fast and furious. The revolution in DNA was followed closely by technological advances and increases in computational power, creating a wave of new science. Today, the Soltises’ Laboratory of Molecular Systematics and Evolutionary Genetics is busier than ever. The museum’s Genetic Resources Repository archives more than 60,000 tissue samples and DNA and RNA preparations from specimens in all the biological collections in the museum. The biological material is stored at negative 196 degrees Celsius for use in long-term molecular analyses. The repository is one of the largest of its kind in the country. 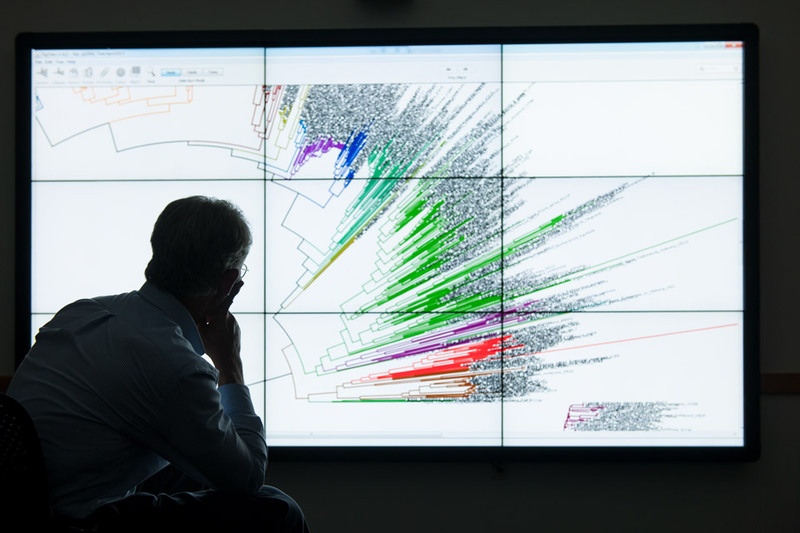 Mastering the computational challenge of the Tree of Life also unleashed a wave of new approaches in biodiversity sciences as biologists saw the power in the new tools, Pam says. At UF, she says, new investments in bioinformatics and in the HiPerGator supercomputer, with 51,000 computing cores and three petabytes of storage, are beginning to pay off. Pam Soltis holds a plant press used to press specimens collected in the field before they are brought back to the herbarium. This plant press has been with Pam since her days as a graduate student. Combining the genetic data, ecological data, and museum specimen data, and then applying technology like remote sensing and computational power allows scientists to integrate data to produce new models, new ways of looking at a problem and perhaps solving it. Species level data are still important, but as Doug points out, scientists who focus on a species realize it has a relationship to other species and to an ecosystem. What happens if you pull just one species, one thread, out of the fabric of life? Its absence will have a ripple effect, and that effect is something scientists are beginning to study in new and exciting ways. Even traditional activities, such as collecting trips, have changed, colored by the urgency with which scientists view the future. On one current project to study Florida trees, the team is collecting the usual vouchers, but also enough leaves to do analyses of DNA, plant chemistry and metabolomics. Other samples are collected to study microscopic creatures in the leaves, such as bacteria. Soil samples are collected from beneath the trees to study soil microbes. Ecologists are part of the group as well. “As a community, we’re recognizing that these samples can be used for all sorts of unpredicted purposes. Just like we’re now using herbarium specimens that have been in our collection for over 100 years as sources of DNA,” Pam says. “Now, we’re thinking, what would somebody in the future possibly want from this collection? As our natural systems become increasingly degraded, the more information we can collect now and house for future experiments, the better. Doug points out that the scientists who collected the 100-year-old plants he has used for DNA analysis, could not have predicted the DNA revolution. Even 20 years ago, DNA analysis on aging specimens was difficult, the material too degraded. But technology has advanced, and today, he says, he can use mere snippets of DNA for sequencing. The data create models, and the more data, the better the models. Already, the Soltis lab, working with Associate Curator of Informatics Robert Guralnick, is modeling the distributions of plant species in Florida. The models use location information and environmental data, such as temperature, soil type and precipitation. 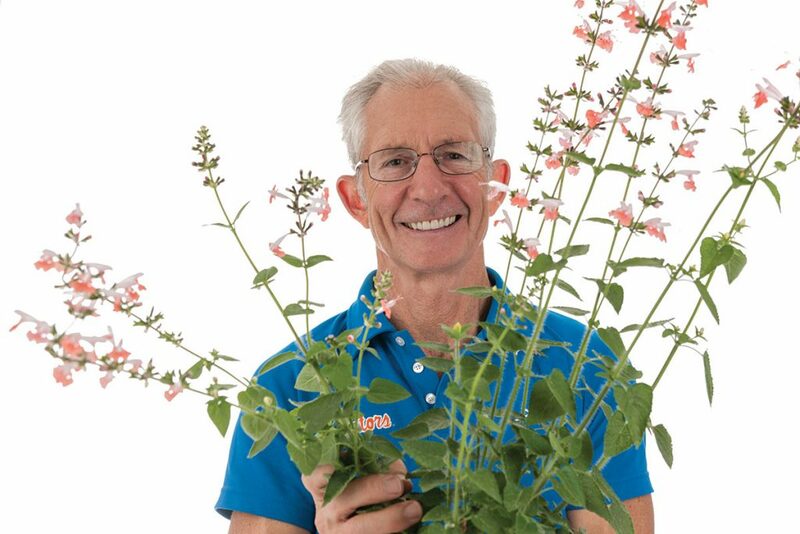 So far, 1,500 of Florida’s 4,200 plant species are modeled, and already some trends are becoming clear. In a changing climate, plants won’t stay put. Some tree varieties, maples and oaks, are moving northward, as are mangroves. Iconic landscapes like salt marshes are on the verge of drastic change. The model, however, needs more input: what are fungi doing, birds, amphibians, mammals? Florida is ground zero for the impact of change on biodiversity — few states have more biodiversity — and that makes UF’s 100-year investment in the museum a solid foundation for the new focus on biodiversity sciences, Pam says. In the Biodiversity Institute, she sees computer scientists working alongside biologists — and alongside students and citizen scientists — to create new knowledge. It’s a great opportunity, she says, to do something lasting. Evolution and extinction are part of life, a balancing act. But when extinction speeds up, it demands attention, and she hopes the Biodiversity Institute can focus attention on the future of the Earth, and humans. “This window we’re in now, the next 40 or 50 years, may be the most crucial window in human history,” Doug says. As the Biodiversity Institute refines its models, Pam says, the goal is to help citizens make decisions. Just as the evolutionary branches on the Tree of Life diverge at certain points in history, human decisions do, too.